Wow! It truly is a goddess, and so are you for creating it. It's fascinating. I totally agree about the movement. Oh your mermaid goddess is beautiful! I love the colors and the wings are great too. 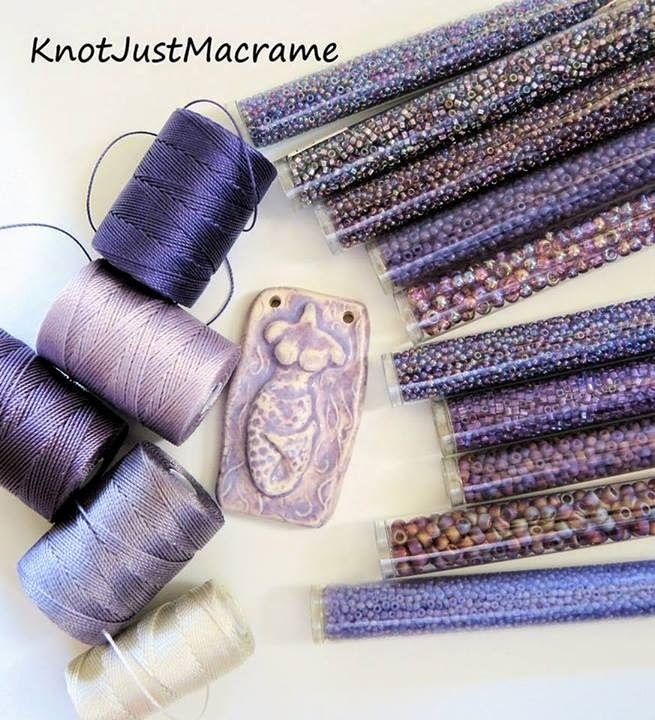 Happy Bead Soup Blog Party! I feel like this should be a holiday - Happy Bead Soup Blog Party Day to you, too!! You've done an amazing job with that focal, she looks like she has wings! Well done. Thank you - I love ALL the pieces you made! Wow, its'a a real showstopper!! Gorgeous! It really has flow and movement and I so admire you micromacrame work! Thank you! I love your bracelets. 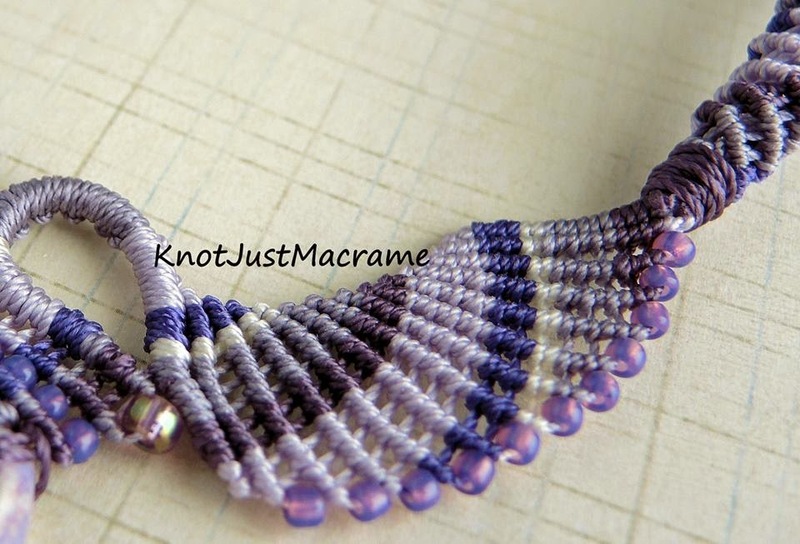 I'm a bracelet fan, so I'm loving the bead weaving one just the way it is! Totally, absolutely exquisitely FABULOUS!!!!! I love!!!! Thank you, Nancy! Hope you are feeling better soon! This is unbelievably beautiful, I am speachless! This piece is art and truly shows amazing creativity. Beautiful and I love this. I agree it really has flow and movements. Perfect! So proud of you. Let me join the others in saying "wow." That is stunning. Love this. I think this is one of your best pieces. Great work. 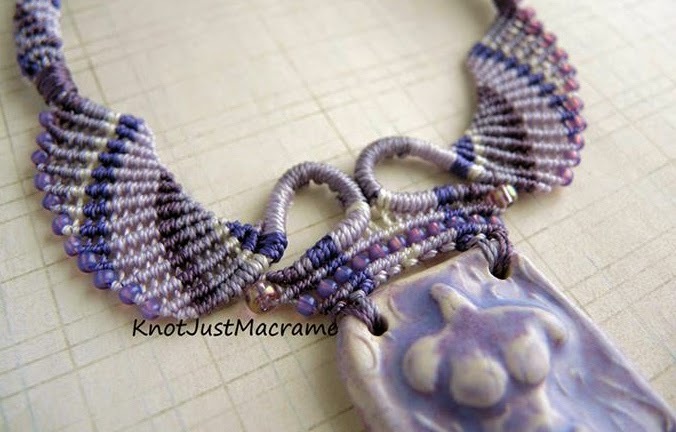 Your macrame is so skillful and artistic! I love the gentle colors of the necklace! Thank you - I took my cue for Gaea's beautiful pendant! OH my goodness how absolutely stunning Sherri - what a beautiful way to frame that focal! And I can see those wonderful knotted wings being used with s many focals - great work. Thank you, Lesley (and sorry I spelled your name wrong on your blog when I commented - by the time I noticed it, I'd hit enter and there's no retrieving it once it's out there!) Your pieces are amazing! Totally awe inspiring work, beautiful. Wonderful. It has a bit of an Egyptian feel with the "wings". I couldn't imagine a more perfect showcasing of that focal. Hmmm... I wonder if that's a Freudian thing. I LOVE anything ancient Egyptian! Oh MY Good Gracious!! That piece is beyond stunning!!! you re a master!! I do look forward to seeing what you do with the lamp work focal!! love your work!! Holy cow, I love that necklace. Your work is truly amazing! Wow - that piece is a show stopper! I love the macrame work you put into that piece and I think you showcased that pendant perfectly! Gorgeous! Wat to add amazing structure and interest to a piece. Great job as always. Wow!! What a show-stopper that turned out to be! And to think you were stumped for a bit. I think it was such a fabulous design, it took a bit to "get out." I can't wait to see what you create with the lamp work focal. Amazing. Your color palette you picked from your cords and beads and your macrame work really complements the focal you used. Gorgeous as always Sherri! You're work never ceases to amaze me! Sherri, you never cease to amaze! WOW, doesn't even begin to express. It looks like you nailed it you achieved the goal of end result matching what you were going for - well done! Hey Sheri! Awesome piece! Not that I expected any less. What a lovely piece! The macrame really enhances the focal without overwhelming it. Sherri, you have raised the bar once again! This design is really fabulous, I just love the wings and purple is my favorite color! Beautifully done!! OMG...that mermaid necklace is gorgeous. Very unique approach! This necklace is just incredible! It has such an organic flow that brings the eye to the goddess. WOW Such lovely work well done! It's like you gave her wings, Sherri...Absolutely gorgeous! This is such a lovely extension of the beautiful pendant, and the wing effect is just perfect! I always love your work, and this is no exception. Awwwwwww, she's beautiful! I love it. It immediately made me think of one of my best friends and how much she would love this. :) That's pretty rad! Have a beautiful and fantastic day! Wow, what an incredible goddess she is! Your designs look so effortless, yet I can see how much work goes in to them, if that makes any sense at all, lol. The lampwork is beautiful and I know I will be back to see what it ultimately becomes in your less forced head space. Wonderful work! It DOES make sense, and thank you very much! I have absolutely had that thought before when someone puts together a piece that just seems like it was meant to be that way - natural and "right". I'm a huge fan of your work Sherri and this is why. Love the colour and the flow of the whole piece. Your Mermaid Goddess is gorgeous! Love, love, love it and it is purple, too! You are the macramé Goddess! Stunning!!! And your micro-macrame is out of this world! I've made small pieces, and I know this is hard and time consuming!!! 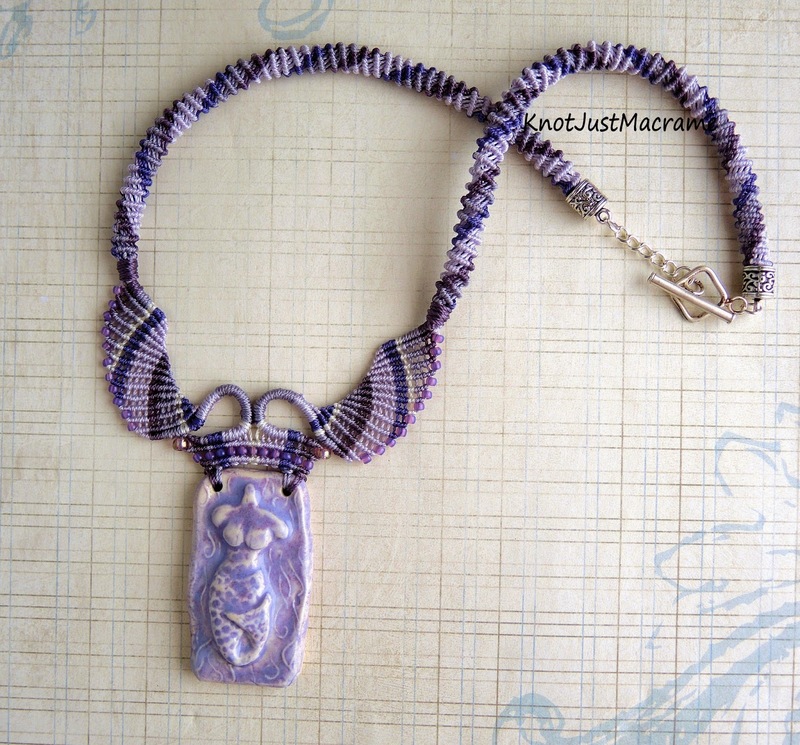 You are the Queen of micro macrame!! This is a stunning piece and I'm always amazed at how you are able to pick the perfect color combinations for both the cords and the seed beads. It's almost like watching someone paint! Wow!! Wowsers that is a stunner! It's almost like two swans are bowing in respect atop the mermaid. And how perfect is that spiral rope? I'd love to know how you did that! OMG!! Your macrame is so spectacular!! Design, colour, shape- I can't breath:))))) I always wanted to try micro-macrame, but I found patience only for maco-macrame:))) I'm so so impressed! This is such an intricate design. Simply stunning!!! Amazing focal!! Completely takes my breath away! 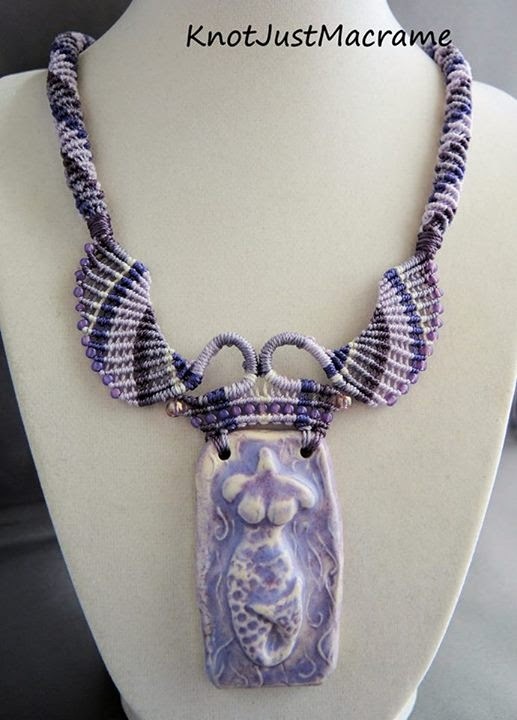 The purple design is amazing, looks like something Cleopatra might have worn! Very cool! Your color blends are always inspiring! Wow! What can I say that hasn't been said? That is a beautiful art piece. Simply gorgeous! I'm a follower of your blog and a fan of your work anyway, but this is amazing! You blow me away with your macramee work. That's amazing! P.S. 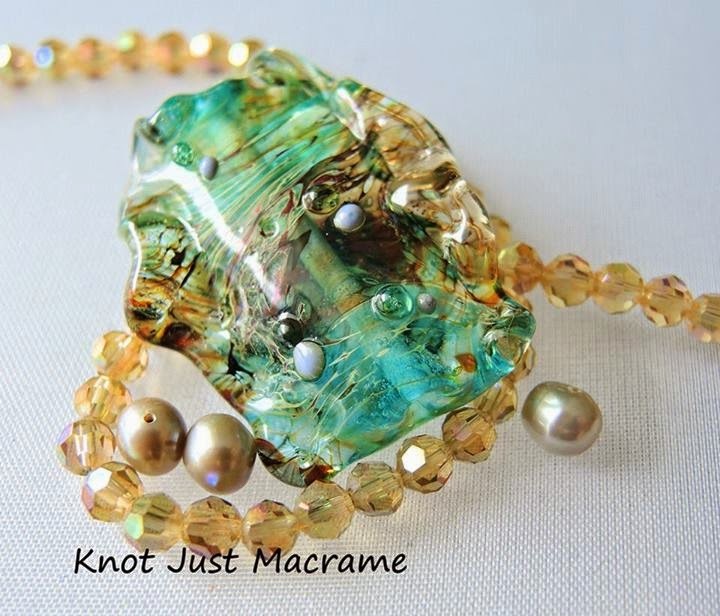 I look forward to also seeing what you create with that exquisite lampwork focal! :) I used Star Girl in my BSBP6 jewelry -- so pretty! I'm off to visit Marianna now too! 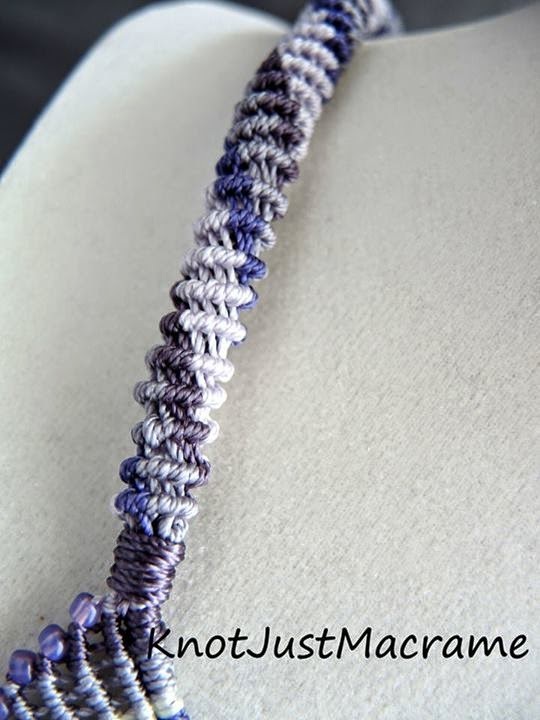 I always want to give a try on macrame technique, and your design truly make me curious want to try myself. Thanks for stopping by and leaving warm fuzzies! Happy hopping! What an absolutely stunning piece! Amazing use of colour and technique. Hi Sherri, You created an AWESOME masterpiece. It is one of the most unique pieces I have seen. The macrame wings really draw attention to the beautiful focal. After looking at your blog I am sure you will make a wonderful creation with the beautiful lampworked bead also. Love the macrame you added to the focal. Gorgeous! Hope you will come back and show us what you do with the lampwork bead. 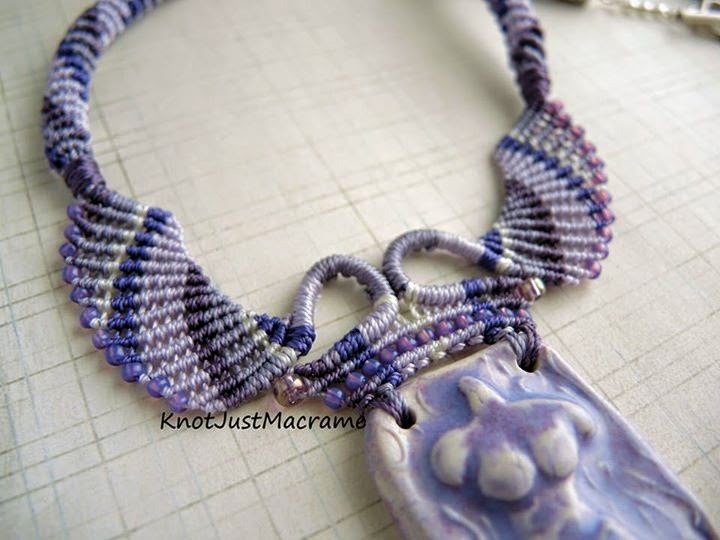 Sherri, I always enjoy looking at your designs and I am in awe of your talent for macrame! This piece is lovely! what a gorgeous piece! I love the cords you chose for the palette and your knotwork is superb! Fit for a goddess indeed! Amazing, simply amazing! Oh Man, wish I had your' skills for macrame knotting. Also saw your actual post, I',m totally fascinated about what you're able to do with cords! Amazing work, Sherry. I am in awe of your skill and artistry. You highlighted the Gaia pendant beautifully. Stunning! Wow. I am owerwhelmed by this piece. You accentuated the focal so beautifully with your knotting. Absolutely wonderful! That pendant is amazing, and what you've done with it is perfect. Mermaid goddess is right. Anyone wearing that would totally feel like a goddess! Wowza! Your necklace is such a beauty. All your knotting skills really gave this piece so much flow and ease that I can't quite put it into words. Well done. Here's hoping you find just the right design for that awesome lampwork bead too. Maybe with the pressure off, it'll just come together. Here's hoping anyway. Amazing piece! Your knotting is just incredible! Fantastic job with your soup! Well done! 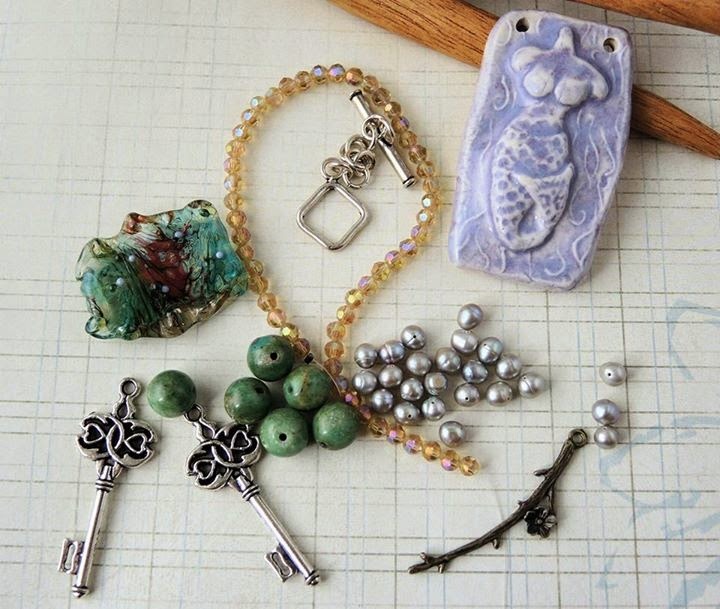 It's tough when your focal defeats all your plans for it:) The necklace you designed really showcases the mermaid pendant though. It was probably meant to be. OMG that is one stunning necklace, incredible design! The necklace you made is stunning! I'm in awe of your macrame work! Such a nice design and it shows off the focal so well. It's a breath of fresh air to see someone using a really different technique for jewelry. Not unknown at all, but you just don't see a lot of macrame around lately. Yours makes me want to try again! Beautiful! I'm not able to say something different than all your other visitors do (-: Stunning, fabulous, etc ... ♥♥♥♥ love this macrame work! All colours come ♥together so well! Your macrame is breathtaking! I came to know about you first on The Beading Gem. The colors, the pattern and the design of this necklace are fantastic! How gorgeous is she?! Love this Sherri!